Sailing the Farm is the title of a book written by Ken Neumeyer in the 1970s. Used copies are sometimes available on Amazon. Details of the book may or may not be perfect, but I find the concept an absolutely outstanding model, and I am working toward putting it into practice. A movable homestead, and a boat undertaking that provides for itself in some of its most pressing needs, from water to fresh vegetables. I’m also very interested in foraging, but that does involve getting to land and all – except for seaweed, which is tasty pulled out of clean water as it floats by! On the growing front, so far sunflower sprouts have been particularly successful. This in soil in deli containers – a shallow container with holes poked in it for drainage, set in a pint one that catches the drips. 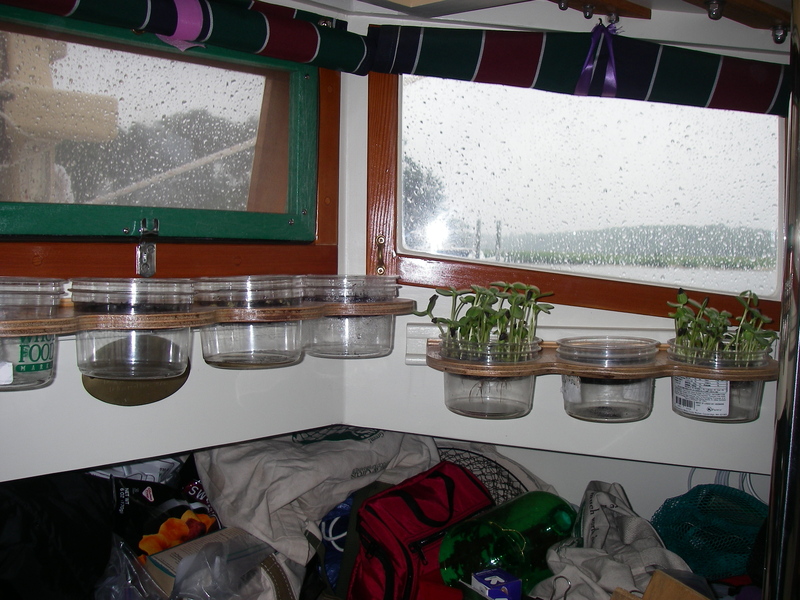 This boat has tremendous windows, and we made removable racks (thank you Theo!) with cutouts the right size for holding deli containers, yogurt containers, and the fancy sprout containers made by The Sprout People. Turns out regular sprouts haven’t been so successful, because of wild temperature variation in the cabin, and the enormous amount of fresh water needed to keep them rinsed. However! It also turns out that another way to do some kinds of sprouts is in about a half an inch of soil in a container. This has been much, much more workable. A couple of tablespoons of water and consistent spritzing keep the plants perfectly happy, and the sunflowers grow like crazy. They’re quite tasty, pinched off at three or four inches tall. And simple: half-inch of soil in the container, sunflower seeds from the natural food store (with hulls) spread over the top of the soil so they are just touching one another, water and spritz. In a few days they start growing. As you snip and eat the tall ones, the slower starters get going, so one container produces for many days. Things that matter for deli container gardens: it seems like it would make sense to use soil from the garden, and it seems like all those garden books that talk about sterile soil are a little over the top. However! Speaking from experience, it’s worth picking up some of that “pathogen free” potting soil. This is because of a little creature called a fungus gnat, that can be just hanging around waiting to get in gear in average garden soil. Out in the garden, it’s not a big deal – they come, they go, they fly away. Indoors, they know exactly where they want to be – moist soil, with plant roots for their larvae to eat. And the only place for that in a boat cabin (or your living room) is all those nice containers with a half-inch of soil, or anything else potted… Besides being really annoying when they fly around, they’re bad for the plants. Which do need their roots intact, after all. An alternative to buying potting soil is to start with soil gathered from the ground and then heat it – some people use their oven, and I have the idea that spreading it thinly in a clear plastic bag in the sun would do quite nicely. But for now, it’s potting soil. The other thing that can help is to add something that feeds the plants. Worm compost is nice – another thing from the garden store. It’s nutritious, not smelly, easy to store and use, and the plants love it. A couple of teaspoons in the soil in each deli container gives it a little something extra, and is easy to manage. So all in all, the boat farm supplies include a couple of quart bags of potting soil, a yogurt container of worm compost, plastic deli containers, some seeds, and a small spritzer bottle. And the best part, the plants give you somebody to talk to! I’m still experimenting with different seeds, so far with mixed results. Will report more on that when some of the details are better worked out. But for now, those sunflower sprouts are exceptional, especially in the hot weather. Many thanks to Jules and Helen, for sending me in the direction of sprouts-in-soil, and sunflower sprouts in the hot summer cabin. Funny how all it takes is the right information at the right time, and next thing you know, you have fresh food! Great wrinkle on sprouts! And I can personally attest to the tasty produce of Shemaya’s garden. I’m thinking, for our space, of a cake pan seeded in varietal rows? Yeah, I think cake tins could work just fine. You might want to put the soil in a tin with holes poked in it for drainage, and then set that one inside another one with no holes, to catch the drips. It can be done without drainage, but adds to stress about getting the watering amount just exactly right. Lately, broccoli has been coming up nicely, from seeds sold for broccoli sprouting. That might do really well in your climate. I’m still working on peas – having some trouble with mold. And many folks say that buckwheat lettuce is really good, and also good in a cool environment. So far, I can’t get the buckwheat to do a single thing, but maybe that’s because it’s been 90°… for ages. But the sunflowers are doing fantastically. Now I’m in Maine – looking forward to the cooler weather catching up eventually!